Golden yellow fully double 6in. blooms, well-suited for mid borders, containers and bouquets. Uniform bush-like plants flower mid-summer on. GARDEN HINTS: Ripe heads are attractive to birds. Cultivate or mulch to control weeds. Sunflower, Teddy Bear is rated 4.6 out of 5 by 14. Rated 4 out of 5 by New York Erratic from Adorable, attracts pollinators but finicky The teddy bears are beautiful and fluffy and attract a lot of pollinators. However, in my area (very damp zone 4), at the seedling stage they were a lot more finicky than other Burpee sunflowers, like the mammoth sunflower. I lost many of the seedlings I direct sowed. If you live in an area like mine, I recommend planting in a container and bringing them inside at night until they have a few adult leaves. My teddy bears thrived in a big (20" diameter) pot. Rated 5 out of 5 by Morganj from Beautiful blooms I ordered these seeds and I have no garden experience. They have bloomed beautifully. I planted seeds directly in the garden. Rated 1 out of 5 by Eamaya from Not sunny enough These didn't take off for me, I don't think they got enough sun. Rated 5 out of 5 by Hubb70 from So cute! It's just starting to bloom along side my cucumber vines. Such a happy flower! Rated 5 out of 5 by Mrgreenthumb from SUN FLOWERS, TEDDY BEAR These are absolutely awesome...grow really fast...I put them in 4 different locations and they are all amazing...great Burpee buy!!!!! Rated 5 out of 5 by twinsandtennis from So Cute! I buy these every year and I really love them. 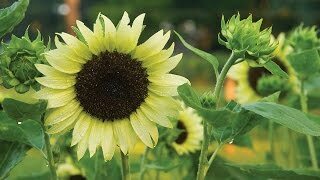 They are hardy and add a nice touch to the other sunflowers. My kids love them too. Rated 5 out of 5 by BinVAB from Great plant whichever you get I bought a packet of these seeds this year and planted a few. It got pretty hot and a few seedlings died but 3 survived and grew. And grew. And grew. I don't know what kind of sunflower I got but it is not "Teddy Bear" even though that's what the packet said. Here's mine...they are orange and grew to over 6 feet tall in a 6 inch clay pot. But we love them and so do the bees! Rated 5 out of 5 by Autumnstar033 from Beautiful !! Wonderful burst of color in the garden. Very hardy stems, bug and drought resistant. Even on the cloudiest day, these Teddy Bear Sunflowers will brighten your day.